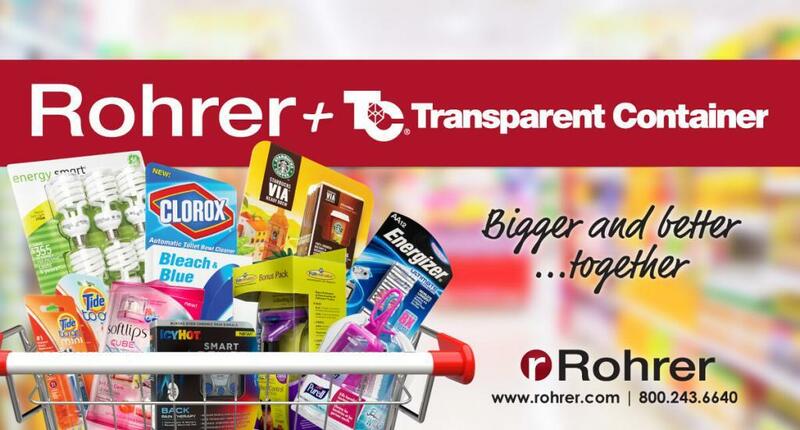 Founded in 1973, Rohrer Corporation is the country’s largest supplier of high-visibility retail consumer packaging. Rohrer’s impressive capabilities include a wide array of printed paperboard products and thermoformed plastic products. Additionally, Rohrer’s design services, heat seal tooling production, and heat seal machinery distribution makes Rohrer a true one-stop shop for packaging solutions. Rohrer is committed to consistently providing a better package to build your brand and your business. To learn more, please visit www.rohrer.com. Since its founding in 1961, Transparent Container Company has become a leading designer and manufacturer of retail packaging solutions including; blister and club packaging, clamshells, printed plastic and paperboard folding cartons, and contract packaging. To learn more, please visit www.transparentcontainer.com.